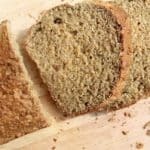 The easiest bread recipe ever – no sieving, no kneading, no proofing! Preheat the oven to 180c. Grease a loaf tin. Mix the flour, bicarbonate of soda and salt together in a bowl. Add the milk, yoghurt and sunflower oil and mix quickly with a knife. Pour the mixture into the loaf tin and bake for 40 – 45 minutes. The bottom of the loaf should sound hollow when tapped. Once baked, turn the bread out onto a wire rack and wrap in a clean tea towel until it has cooled.